Mark Brandi’s debut novel is more than atmospheric: this is visceral Australian noir. Jock Serong introduces us to the next big thing in Australian crime fiction. Brandi is a writer who pays close attention to the physical; to the shapes and smells and sensations of the human body, set in vivid contrast to the torpor of a dead-end town. 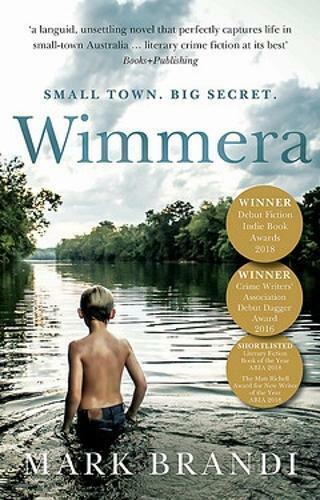 Wimmera is the story of two best friends, Ben and Fab, growing up in north-west Victoria in the late eighties. Alongside the ordinary rituals of two teenage boys in a country town (cricket, yabbying, bullshitting each other), there are darker pressures that bind the two of them: their innocent adventures veer within reach of sinister forces. Fab’s migrant dad is a study in bottled fury. The suicide of a girl they knew, a girl they thought they knew, leaves them helplessly questioning each other. The tragedy brings about a change of occupants in the house next door to Ben, where the death occurred. The incoming tenant is a single man who immediately ingratiates himself with Ben’s parents, but sets the young boy ill at ease. Brandi takes great care to reveal this malevolent character in layers. Ronnie is charming, physically strong, blokey. He drives a Statesman De Ville, a bloke’s car. He’s interested in Ben, too interested in Ben. The dread builds in increments, the desire to shout at the kid, ‘No!’ But Ben blunders forward, obliging, trying to be polite. Brandi’s language in this unsettling novel is carefully constructed to mimic the thinking, and even the speech patterns, of a boy in the sexually preoccupied throes of early puberty. But Wimmera’s evocation of that world is of a much stronger kind than mere voice: the author effectively builds a wall behind which we’re privy to the two boys’ decision-making, and correspondingly separated from the world of adults. In this respect I was reminded of Michael Sala’s recent novel The Restorer, though Sala plays both sides of the wall more than Brandi does. The other touchpoint is Rob Reiner’s 1986 film Stand by Me, which was based on an early Stephen King novella, The Body. The point is, only the deeds of the adults – callous, despairing and violent – are visible on the reader’s side of the wall. But the motivations that propel the deeds: concern and thwarted dreams and even lust, are obscured. Reaching back into the distant past to find that age again, it occurs to me that this is an authentic rendering. Parental motivations, the architecture of their relationships with other adults – these things were imponderables. Half the time you were too headstrong to analyse them: the other half they were being actively hidden from you. In some families the hiding was benevolent – in others it wasn’t. Either way, what you were left with was consequences. If you were lucky you dodged the worst of them. There’s an extraordinary level of period detail in Wimmera: the movies (Witness, Amelie), the TV shows (Rocky & Bullwinkle) and the gear (Nike Air Maxes). Everyone smokes. The schoolyard is nakedly depicted as a vicious zoo. Brandi fixes with brutal realism on the Australian country towns of the time; modern in most senses, but isolated and introverted before the internet and job mobility. The realism is just as stark when the story moves into its second and third acts: the adult Fab, struggling with the loss of everything he holds dear. A generational shift has occurred, and the schoolyard bullies he despised are now his workmates and fellow drinkers. The bleak expanses of the Wimmera seem to have him ensnared: he could go to Ballarat to start again, he ponders at one point, ‘or up north, somewhere tropical’. But it all seems too hard. Working away underneath all of this is a cross-current, an echo of his childhood and his friendship with Ben. Something unresolved, carrying with it the potential for both redemption and final damnation. I’m being careful with it here, you can tell, because Brandi does such a great job of setting up a plausible dénouement for the defeated Fab. Suffice to say that the foundations of loyalty so richly depicted in the childhood scenes will be severely tested. Wimmera has already gathered a pile of awards, both here and overseas, including the Victorian Premier’s Award for an Unpublished Manuscript and the CWA Debut Dagger in the UK. Brandi comes from the traditions of short-story writers – and the book’s structure shows this in its use of short, tightly wound chapters. His interest in criminal justice is also evident throughout this richly nuanced work. Readers will find echoes of Craig Silvey’s Jasper Jones, Jane Harper’s The Dry and maybe even Garry Disher’s Bitter Wash Road in the depictions of forgotten towns on the plains. But Brandi has a voice all his own, and Wimmera signals the arrival of a welcome addition to the ranks of those Australian writers. Jock Serong’s first novel, Quota, won the Ned Kelly Award for Best First Crime Novel. His next, The Rules of Backyard Cricket, was shortlisted for the 2017 Victorian Premier’s Literary Award. His next novel, On the Java Ridge, will be published next month.